Why are private buyers flocking to the auction? After writing several articles about the rise of the private auction buyer and why they are turning up to bid in their droves, curiosity finally got the better of me this week. In the course of my work in the trade I have to visit the auctions several times per month and not necessarily in a buying capacity but often just to get a “feel” for the market and what prices cars in general are making. I decided that this week, rather than speculating I would actually ask some private buyers (you can tell who they are because of the parkers guide or other motoring publication under their arm) some simple questions about how they found themselves buying from auction. “It’s a great fun day out.” (Probably needs to get out more). “I was told that it’s not like the old days where you could end up in a dodgy car and get ripped off, the descriptions are very accurate”. These are some of the many comments I had, and I suppose there are no real surprises. Bizarrely though out of the 30 or so private buyers I spoke to only 8 had actually bought a car from the sale that day, but 18 of them were on a least their second visit. Who would have thought that customers are getting fussy at auction too? On a serious note however this is just another sign that dealers of all types certainly need to up their game if they don’t want more of their potential customers being empowered to use an auction as a buying solution. If the OFT have anything to do with it, soon those dealer improvements may not be optional! And how are we supposed to ‘up our game’?? There’s a shortage of stock, customers want more discount, overheads have increased in many areas and dealing with the public and the even higher expectation level is more difficult than its ever been. There may be a few dodgy dealers out there who continually spoil it for others but there are still alot of us hard working types who are at a loss to know what exactly what more we can do in this market. You may be a hard working dealer but the fact that the auction is now full of push chairs and parkers guides must mean that people have just got p#ssed off with buying cars from car pitches and would rather take their chances,how sad that this is what its come to. I still remember when dealers asnd buyers could both be happy!!! I don’t think that people have neccessarily got p#ssed off with buying from dealers its more to do with the fact that most used car buyers want a perceived amazing bargain at the moment. Unfortunately in these times for dealers who know the job and do it properly, no-one wants to pay a bit extra when it comes to knowledge and service. There will be casualties though, the car auction may appear a slightly more user friendly place than it used to but there is no-one to moan and groan at when it all goes horribly wrong after 2 weeks and 500 miles! More of the general public are going to auctions for two reasons. 1) They want to save money. 2) The media including motoring programes and magazines encourage it as a good idea. 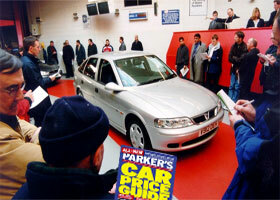 I have been trade buying at auctions for many years and what I see now are the general public paying the same retail price, if not more, for something they could buy at a dealers or out of a magazine for the same price, but at auction they cannot test drive, have no warranty and are sold as seen ‘with all faults’. I see many people going away happy but look at amazement at the price they have paid. I think they are missing out on the many benefits that a dealer can offer for similar money. Yes there are some bargains to be had, but the majority are paying too much. which brings everything back to perception,because if people think they have cut out the middle man,ie the dealer they get the feeling that it must be cheaper to buy at auction,but like cameron says when the car goes wrong and costs them to put it right after a short time,they may end up wishing they bougght from a dealer after all!! and anyway what price do you put on aftersales service, like warranty,breakdown cover,courtesy car,and someone to ruck at,the people who buy from auction must have had a bad time with someone or think that cars are so cheap at auction they will still save money,its probably cyclycle a few high profile disasters and the sheep will go back to their pens!! If the public want to circumnavigate the trade by buying at Auction so be it, but the term SOLD AS SEEN means just that at Auction, something we as dealers cannot hide behind on a forecourt. The real protection lies within the trade as a whole for the consumer, with trading standards there to protect and advise. Think about that next time you buy the so called “Cheap Car” at auction, as far as i am concerned there is no such thing as CHEAP decent cars to be found at present.. As in most things in life nowadays, you get what you pay for.